A La Memoria de Los Fusilados (mixed media sculpture to the left) is a memoriam I made for the several hundreds of victims murdered by Ernesto “Che” Guevara, many of whom were innocent and some who were children and pregnant women. Since the Cuban Revolution of 1959, many people inside and outside of Cuba have fallen victim to the machinery of misinformation crafted by the Cuban government. The rampant idolization of the murdering zealot known as “Che” Guevara is an example of the effectiveness of the tool of political misinformation through the means of propaganda. This work came about a few years after I had had a conversation with a friend named Kevin Glynn, who is a history teacher at an inner-city Los Angeles public high school. We were speaking about the hardships that my family personally endured at the hands of the Castro regime and of my father’s personal face-to-face contact with “Che” Guevara, during our exodus from the island. 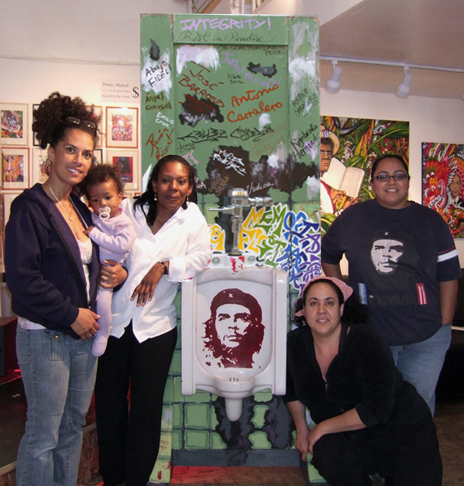 One day in 2009, when I was rehearsing at my art studio (in Chinatown, Los Angeles) with two of my Cuban-born female friends, Maria Elena Gil and Sara Whittaker, the performance piece that I do with this memorial urinal; a young Latina woman, wearing a “Che” Guevara T-shirt walked into my art studio with her mother. She immediately expressed her fondness for the urinal sculpture. I said, “But look, the man who’s on your chest is on the urinal, you know, where men pee.” An intriguing and respectful conversation ensued. As is customary, I asked her if she was familiar with some of the words and deeds of the man on her chest, and how she came about wearing his image. She said that she honestly did not know much about him, but that when she was eleven she saw the T-shirt hanging in a store in Mexico and, not knowing who the man on the shirt was, begged her mom to buy it for her. When I asked her why, she said, “because he just looked so handsome.” Her mother then recounted to me the instant infatuation her daughter displayed over the image, and the fervor with which her daughter had pleaded her to buy the shirt for her, which she did. The young woman gave me permission to be photographed with her beside the urinal and my Cuban-born friends, and to post the picture and her story on my website. I invited her to tag on the “bathroom wall” a name of one of the victims “Che” Guevara executed, if she felt so inclined, and she did. I keep a partial list of some of the victims’ names, posted by the urinal with tagging instructions as well as some of “Che” Guevara quotes.) The young lady’s response to my questions reminded me of the conversation I had had, a few years prior, with my high-school-history-teacher friend, Kevin. In that conversation with Kevin, years before, we discussed political propaganda and the power of image as it relates to art. I had not yet created the urinal memorial and would not do so until 2009, about two years later. The conversation touched upon the political nature and complexity of some of my art pieces and the simplicity of some works of art exhibited in museums, such as the infamous 1917 “Fountain,” by Duchamp, which is nothing more than a displaced urinal. I commented to Kevin that I had heard of some Miami Cubans displaying a roll of toilet paper with the face of Fidel Castro on each square. Kevin then suggested that I paste the image of “Che” Guevara’s face on a urinal and hang that on the wall, next to the Fidel Castro toilet paper. We spoke about the criticism that I would assuredly receive for displaying the image of an international icon on a surface where people urinate and I said that I didn’t know if I was prepared to receive that. I also indicated that lots of people may prefer to see the face of George Bush on a urinal. During the two years that passed, since that conversation, I thought about Kevin’s idea from time to time. Initially, the thought of putting the face of a deceased person on a surface upon which men urinate, regardless of the crimes that the person committed, rested uneasily in my mind. I struggled with thoughts of “Che” Guevara’s children seeing the image of their father’s face on a urinal and with thoughts that “Che” Guevara may have possibly earnestly pleaded to God for forgiveness and redemption before his own execution. Then I thought of the the plethora of people, living today, who are the children of innocent people who were executed by “Che” Guevara. I imagine it must be very difficult for the surviving family members to see the face of the man who wrongly executed their father or mother, brother or sister, husband or wife, plastered every where and enshrined on billboards, T-shirts and even the bibs of babes, as I have seen myself. I imagined where they would rather see the face and I thought of the urinal. These thoughts continued to visit my conscious until they finally overtook my subconscious, artistically, in my dreams. In December 2008, just before my parents flew into town to celebrate their 50th wedding anniversary in my art studio which is filled with my paintings of our ancestors; the poem Song of Che Chango: Rendezvous en La Habana 2013 came to me in my dreams. I believe that the spirit of my father’s father (José Rodríguez Figueroa) put the rhyme in my mind. The poem and visions of the related artwork came to me in three parts, over three nights. When I awoke, on these three mornings, I wrote the parts of the poem on paper and sketched the image of the dream on canvas. On the third day, within a matter of just a few minutes, I had memorized the entire, very long verse. That is how the poem, the related painting and memorial sculpture, and the performance piece were born. In my dreams, I created a fictitious character, a Cuban graffiti artist and poet/rapper with the pen name, “Che Chango.” He is married to a graffiti artist and poet/rapper with the pen name “China Ochun.” (My nick name, since birth, is La China, because my eyes were very Chinese as a baby and child, on account of my great-grandfather Chung.) The fictitious couple are parents and live in La Habana. They go about the streets, defacing Cuban political propaganda with their graffiti and rapping their sociopolitical poems to people whom they encounter, during the making of their art. Their art and poetry are driven by their own personal suffering which is relevant to current sociopolitical happenings on the island. In the content of the rhyme are stories from my own Cuban ancestry, from my family’s real-life struggle in Cuba, from my experience during my 2002 Cuba homecoming and from social-political events that have happened on the island. The performance culminates in audience participatory graffiti where spectators tag the names of those murdered by “Che” Guevara on the bathroom wall. It is clear to me that “Song of Che Chango,” with all its graffiti and rap elements, however contemporary, was born in my dreams ancestrally, through the intercession of my grandfather’s spirit. My grandfather José was a poet, a published author, evangelical pastor, Mambí (insurgent soldier in Cuba’s war of independence from Spain) who served as a war correspondent, a multi-linguist, a professor, painter and an idealist. He was born a “Pardo Libre” (free black man of mixed descent), as is indicated on his birth certificate, in 1868, almost two decades before the institution of slavery was abolished in Cuba. 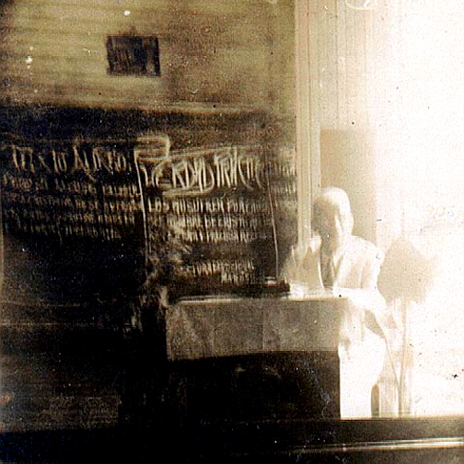 In the humble and poor Black churches in Cuba and Jamaica which my grandfather founded and in which he was the pastor, the congregations referred to him as “El Profesor.” He was known for writing lessons of the scripture upon chalk boards which he personally constructed from scratch. My father, José Rodríguez Bernard, raised us in the same manner as did his father rear him, tutoring us in the evenings upon a large chalk board in the kitchen which my father himself had constructed from scratch, and upon which my father wrote the titles of his lessons with the same flowery script as did his own father. A former professor of electrical theory, my father painstakingly taught us this inherited style of penmanship. I often wrote the title of my homework assignments in this learned stylized family script. The style of handwriting resembles the script of contemporary graffiti writers, though of course my Abuelo would have denounced the criminal element of graffiti writing. It is therefore, however, that executing the graffiti on this memorial and the related painting came so easily to me. 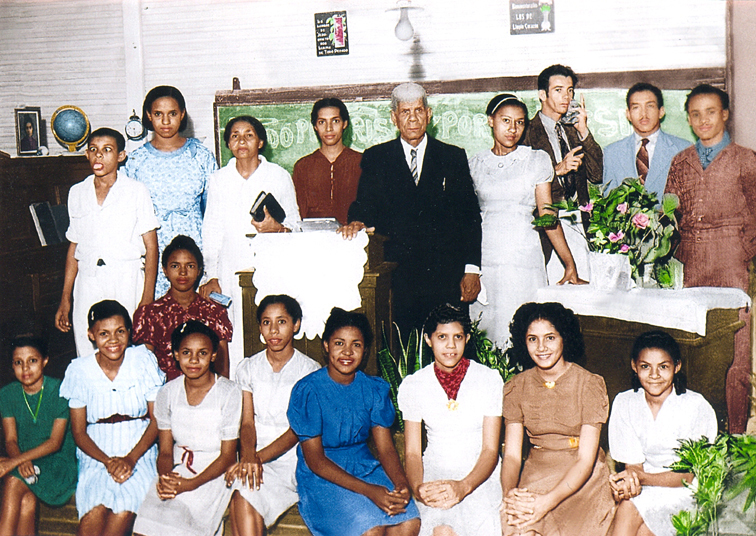 Below is a March 1940 picture of my grandfather José on the pulpit of his his church in Santiago de Cuba with his family and some of the youth in his congregation. He called the church Las Buenas Nuevas which translates to “The Good Newness” in Spanish. The church was also a school he ran and his house. It was located on La Calle Trocha in Santiago de Cuba, just about six blocks from the house where I learned to walk and talk, where lived as a baby and toddler. My other two aunts (of my four paternal aunts pictured here) are on the bottom row, 2nd from left and farthest to right. They are posed in front of the chalkboard my abuelo made and decorated with biblical scripture in his graffiti-esque handwriting. My grandfather is the stern pastor with the white hair and black suit, standing underneath the light bulb, between two of his four daughters (all in the picture). My grandmother, Harriet Bernard (whose surname I adopted professionally) is the Jamaican woman in white with the bible in her hand. Their only son, my father is the pre-adolescent boy to the left, sticking out his tongue. This is my favorite picture of my family heritage. It speaks to me of the clarity with which my abuelo’s spirit strongly influences my artistic and literary work, leaving resonant signs of his input. In the dreams, Che Chango has an encounter with a hip African-American tourist who walks into a Havana public restroom, wearing a “Che” Guevara T-shirt and a tattoo on his arm, reading “Hijo de Obatalá.” At the point of encounter, Che Chango is tagging a stenciled image of his father’s killer (“Che” Guevara) on the urinals. The bathroom walls are freshly and elaborately decorated with Che Chango’s political graffiti, spelling out “40,000 + Ejecutados” (40,000 plus executed). Che Chango pauses and poetically shares some words with his Afro-American brother. The rhyme explores “Che” Guevara the icon and “Che” Guevara his words and deeds, while taking a ride through the cycle of suffering and rebellion throughout Cuba’s history which my ancestors endured. The poem is what Che Chango would have said to his African-American brother if he could rap in English, as could my grandfather José. I have wondered how much the language barrier plays a roll in the non-Spanish-speaking world’s ignorance of the current civil rights struggle in Cuba, on top of the silencing of dissident voices through censorship, incarceration, threats and violence perpetrated against them by the Castro regime. If contemporary young dissident Cuban rappers such as El Aldeano, Papa Humbertico and Eskuadron Patriota, could or would rap their protest poetry in English; would Black America wake up to the cry of help from their Black Cuban brethren? I do believe that if my abuelo José were alive today; he would view these young valiant rappers as his fellow Mambises in Cuba’s new revolution. There is an innate similarity, between my abuelo José and contemporary Cuban rappers, in their mode of opposition against the regime. In both instances, their weapons of choice are ones of peace. Contemporary Cuban rappers employ their poetry and music as their armament. In his service as a Mambí war correspondent, my abuelo José donned a pen and paper as battle gear. I imagine that if my abuelo were alive today, being the multi-lingual author that he was; he would translate and publish into English the poetry of these Cuban rappers, in order to summon the support of the outside world in their plight. Below is a video of one of my live performances of Che Chango, with my children, before a crowd of over 3,000 people, many of whom were Cuban immigrants, like me. I’ve done many performances of this spoken-word public engagement piece. This one was at the 17th annual Cuban Music Festival in Echo Park, Los Angeles in 2010. It was in this vein that I signed the open letter to Raul Castro, Acting on Our Conscious, in the fall of 2009, when I was invited to do so with fifty-nine other Black American artists, intellectuals and activists, including Cornel West, Ron Walter, Ruby Dee and Mario Van Peebles, among other dignitaries. The letter protests the racism and obstruction of civil liberties that exists in Cuba, which has long been denied by the Castro regime, and states support for our Black Cuban brethren. The signed document has succeeded in helping to bring light to the civil rights struggle on the island, where dissidents (such as the late Orlando Zapata Tamayo) have risked and sacrificed their lives in hunger strikes, as a plea to the world for help, while the Castro regime remains busy, attempting to discredit the martyrdom and the dissident movement through defamation and distortion. Of the sixty Black Americans who signed the open letter to Raul Castro, I am in a sort of unique position, because I am the only one who is also a Cuban immigrant. It has been frustrating for me to witness, throughout the years, Black America fall victim to the machinery of political misinformation crafted by the Castro regime and turn a deaf ear to the truth of the oppression and racism that the Cuban government continues to propagate, a reality that I and my extended family have experienced on the island. However difficult, I try to maintain as compassionate a stance as possible to all sides, with regard to the civil rights struggle in Cuba. It is my prayer that in the end, truth will prevail – truth being Love. I therefore remain busy in the development of Ceiba de Cuba, in hopes that the work-in-progress will help to cast light on the long-endured suffering in Cuba. It is my hope that the fourth part of Ceiba de Cuba (“De Su Flor: Of Her Flower”, in which “Song of Che Chango” appears) will function as a vehicle to help bring some attention, however humbly, to the civil rights struggle in current day Cuba. The first step in the poem is the demystification of an emblem in the 1959 Cuban revolution, that being Ernesto “Che” Guevara. I have been criticized about paying so much attention to a dead man. Part of the purpose of the performance is to illuminate the effectiveness of the political misinformation formulated by the Castro regime and by governments in general. In exposing the myth that “Che” Guevara was an altruistic philanthropist when in reality he was an indiscriminate and relentless assassin, by his own admission, it is my hope that people will begin to see through the veils of political distortion and revisionist history. I have always considered it so ironic when Americans, who vocalize opposition to the death penalty, wear the image of one of the proudest advocates and executors of the death penalty plastered on their chests. It is my prayer that, before mounting the vehicle of political propaganda by donning a T-shirt of a ruthless murderer; these people will put on compassion and consider the pain of the surviving family members upon whose sight is thrust, over and over again, the face of their wrongly-executed loved-one’s killer, eulogized everywhere as a hero and in some places even as a saint. Scroll down to read some of Che Guevara’s quotes, pertaining to his beliefs about execution, and to see a partial list of the names of some of the people he executed.